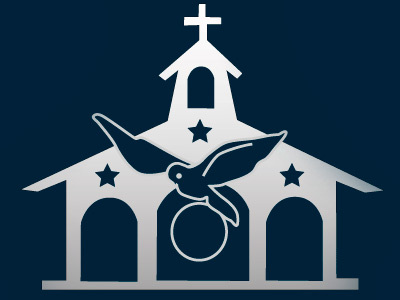 As you probably already know, the Home of the Mother has get-togethers every month in Valencia, at the Parish of "Nuestra Señora de los Dolores." It is usually every 4th Saturday of the month, except when otherwise announced. This April, we had our get-together on the 17th of the month. 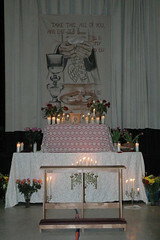 Everything started at around 11:30am with Mass, which was celebrated by Fr. Vicente. 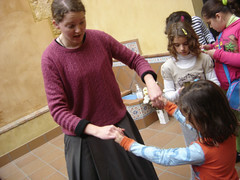 Sister Sonia and Sister Beatriz came from Getafe. A group of Servant Brothers have had the grace and joy of participating in the Beatification of Servant of God Bernardo de Hoyos, SJ. 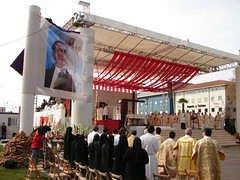 On April 18th, 2010 in Valladolid (Spain), Servant of God Bernardo Francisco de Hoyos was raised to the altars. The new Blessed was born in Torrelobatón (Valladolid) on August 21st, 1711. 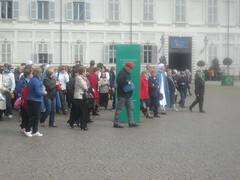 On April 13, we had the grace of being able to travel to Turin on a pilgrimage to see the Holy Shroud, which is on display from April 1 – May 23. This year, for the first time in the history of the Home, there was a Holy Week Encounter held in Canada. Thanks to the great efforts of Jaime Arturo and his wife Maria Consuelo, and others who generously gave of their time and efforts, this has been made possible – even despite the anger of the devil who made every effort to stop it from happening by placing obstacle after obstacle and difficulty after difficulty. And yet, as Christ has already overcome him, he was unable to do anything and the encounter brought many spiritual fruits, especially in the form of a greater knowledge of the Home, union among its members, and a greater consolidation of the group. 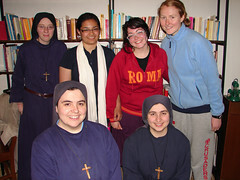 Here in Lumezzane, we Sisters held an encounter with young people at the parish during Holy Week. 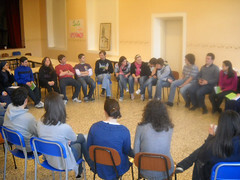 We had been thinking about the possibility of offering the parish a youth encounter during the Paschal Triduum. It was all an adventure and somewhat a challenge, as it is not customary to have get-togethers during this period of the Liturgical Year. The first to be surprised were the priests themselves, when we mentioned it. But, thanks be to God, they trusted us and had no problem with it; in fact, they were very supportive and helped us out in preparing it, although they were a bit hesitant of the success it would have. 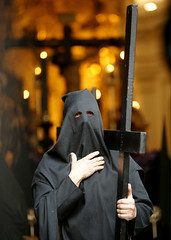 One's heart is overcome with inexpressible feelings as it observes endless lines of “Nazarenos” and “penitentes” fill the streets of Seville amidst a solemn silence, as though there were nothing else in the world besides “their Virgin” or “their Christ.” One is surprised to find such popular devotion amidst such a secularized world and it is incomprehensible without an understanding of the history and tradition of such unique customs, as are those of Holy Week in Andalucia (southern Spain). We, the Sisters in the communities of Chone and Playa Prieta had our Holy Week Encounter, which began with the Chrism Mass in Portoviejo. Fr. 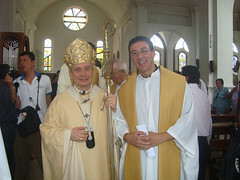 Jose Javier and Br. Greggy came from Nicaragua to help us out in the Home's activities. They celebrated the Mass during the girls' camp and later, we all came together at the school in Playa Prieta, as we have done in past years, to have the Holy Week Encounter. Yesterday, Sunday, April 11th, Feast of Divine Mercy, several members of the Home of the Mother in Canada came together in the Perpetual Adoration Chapel at St. Mary's in London (Ontario) at 6:30am. Why? 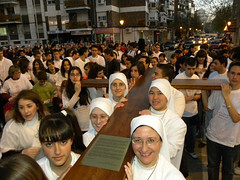 To adore the Lord, to give Him thanks, to celebrate this Feast of Divine Mercy, and to unite ourselves especially through prayer, at the same time at which a Mass was being celebrated in Barcenilla (Spain), in which Nicolás Umaña would enter as a Candidate of the Servant Brothers of the Home of the Mother. Around two hundred and thirty people gathered together for the Home of the Mother Holy Week Encounter, in Ocala, Florida. The theme of the Encounter was "Ecclesial Movements Within the Church". 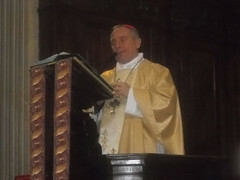 Extracts from books written by Cardinal Ratzinger and Cardinal Angelo Scola were used for the talks. This year, we held our camp in Ecuador in a very beautiful location, near the small town of “Honorato Vasquez.” The campsite was called “La Finca” and the owner let us use it the whole week free of charge, with the possibility of using all the facilities on the site, as well. He deserves some well-said prayers for his generosity. His name is Fabian. The day before we left, we learned of the usual cost of using the facilities there and we estimated that it would have cost us around 1,000 dollars! We were very amazed by his great generosity, and he even invited us to come back whenever we wanted. 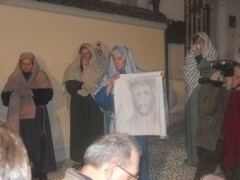 On Sunday, March 28th, Palm Sunday, we had a Passion Play in our Parish of “San Apollonio” in Lumezzane. On February 15th, Sister Kristen Gardner and Sister Sonia Moset, currently in the community in Getafe, began their “daring” work on the great event that will take place in 2011 in Madrid: World Youth Day (WYD) with the Holy Father. 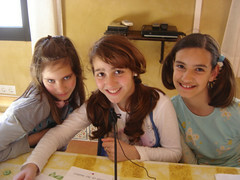 The two Sisters form part of a communications team for WYD, which is working on the website. The Director of this department is Yago de la Cierva. The cross that Pope John Paul II presented to the youth of the entire world is now visiting the dioceses of Spain, in preparation for World Youth Day, which will take place in Madrid in 2011. 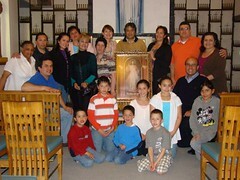 As you probably know, during this time of Holy Week and Easter 2010, the Home of the Mother has held Encounters in Ecuador, Canada, Spain, and the United States. In Italy, we did not have an Encounter officially speaking, but at the community of Servant Sisters here in Rome we invited three girls from the Franciscan University of Steubenville to spend these days with us and thus, have an opportunity to better live out the Paschal Triduum. Their names were Cassie, Alberta, and Bernadette. Like they did last year, this year the boys in Ecuador had the Home of the Mother Camp before Holy Week, March 26th-31st. This year, there were 32 boys. 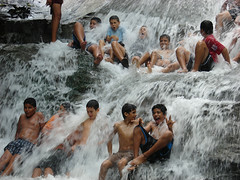 Many were from Playa Prieta and there were a few others from Chone. 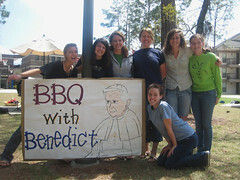 50% of the students at the University of North Florida (population about 18,000) are baptized Catholics. Statistics have shown that at least 70% of incoming Catholic freshmen will lose their faith completely within the first two weeks of coming to college. This solemn title is the name of a new radio program for children and young people, which we are now preparing here at the community in Seville. Following an appeal for greater collaboration in the Home of the Mother’s mass media, we got to work here in Alcala de Guadaira.